We were so close to missing out on this beauty had it not been for Paula. 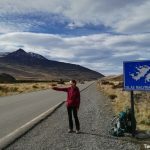 She took us along in her car when we were hitchhiking on the Ruta 40 in Argentina and told us about her day of kayaking at to the Cuevas de Marmol (Marble Caves). At that moment Kevin realised that he had been wanting to see this place too. 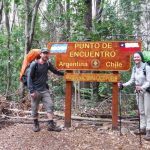 So, the next day we turned around, hitchhiked back to where we had come from the day before and made our way to Puerto Rio Tranquilo. 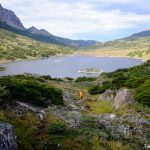 After a very relaxed evening in a cosy hut in the backyard of a hotel, we were ready to get out on Lago General Carrera and see the Cuevas de Marmol. 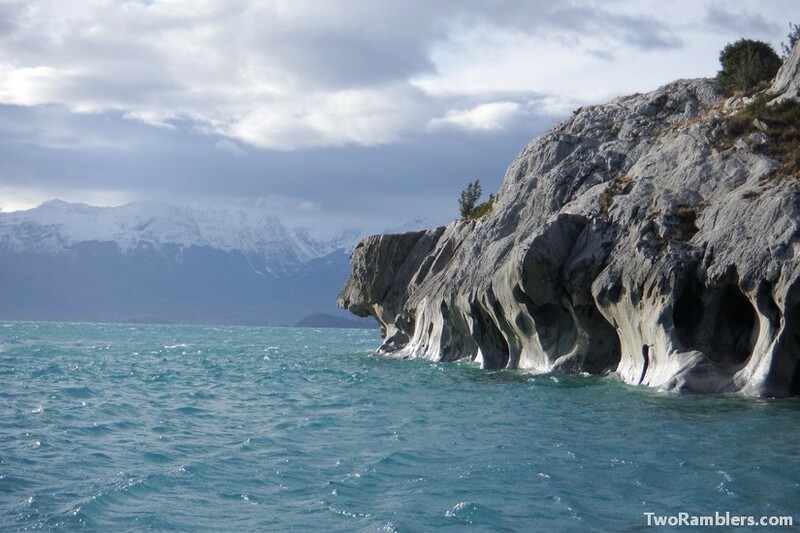 Actually, out on the lake are several stone formations to visit: the Marble Caves, the Marble Cathedral and the Marble Chapel. We decided to take a speed boat that would bring us out on the lake to see them all. 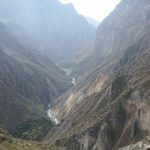 There are numerous companies in Puerto Rio Tranquilo that offer these tours, all at more or less the same price. 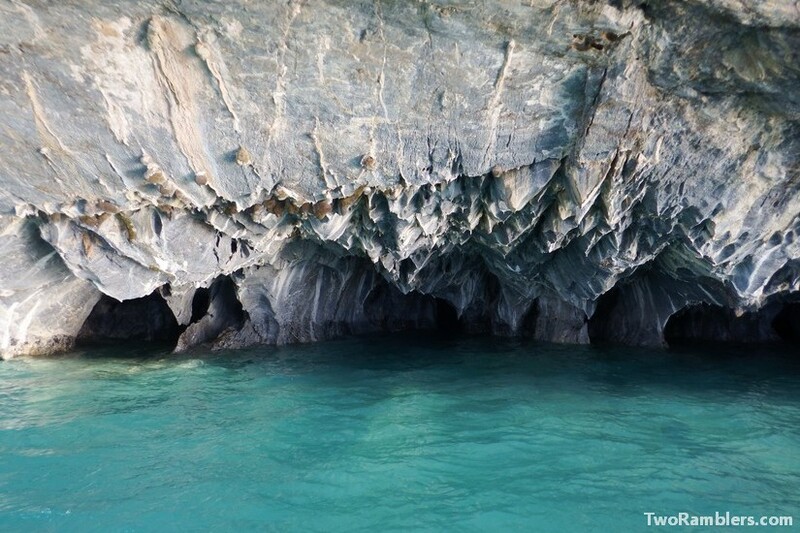 It only gets expensive when you want to kayak around and into the caves. Therefore, we decided to stay in the speed boat and did not regret it. 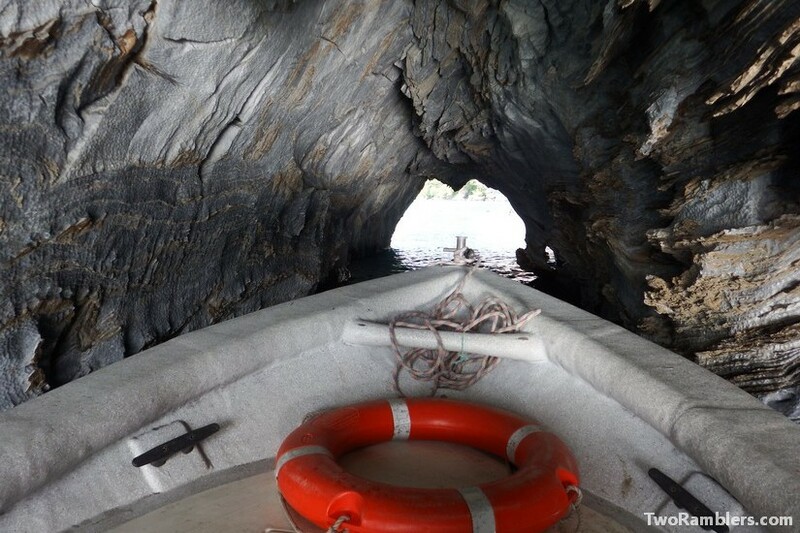 Even with this boat we were able to get very close to the caves. It was a sunny morning as the boat brought us out on the lake. With us were four other tourists who all had decided to use kayaks. They were piled up in the front of the speed boat as we navigated towards the caves. Two guides were with us providing us with fun facts about what we were about to see. 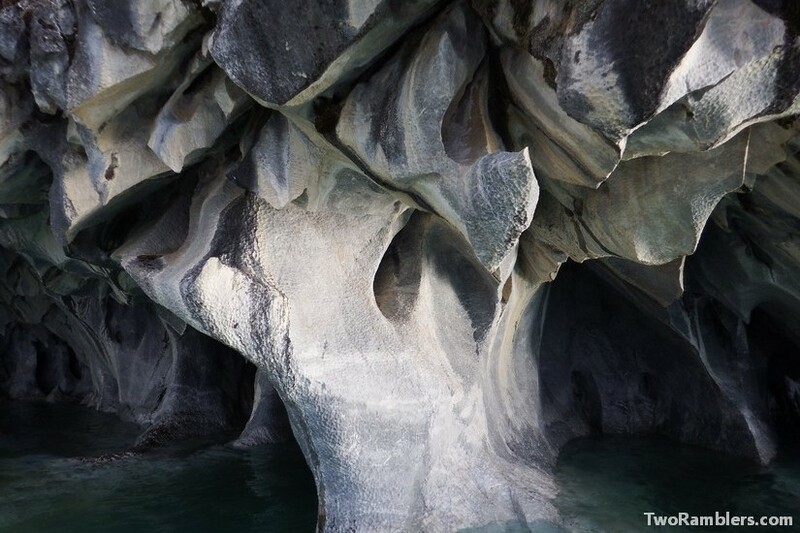 Our first stop were the Marble Caves. 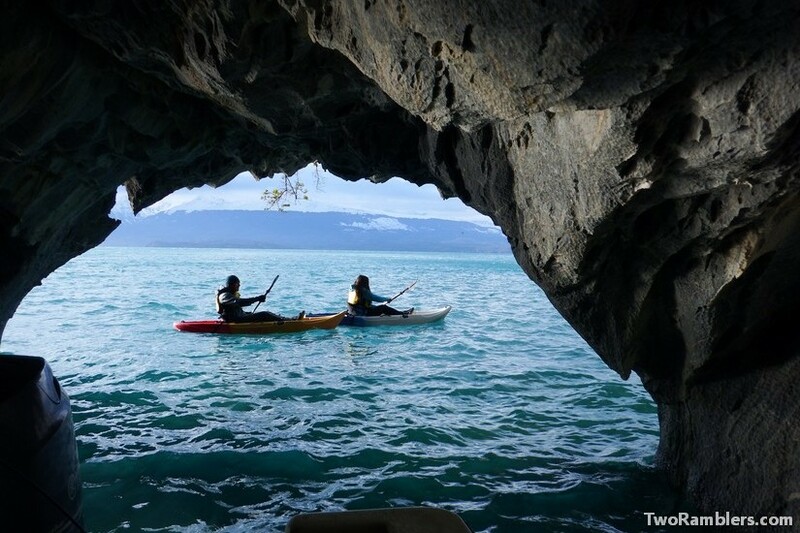 The kayaks were put to water and the other tourists were able to go deep into these caves but so were we. Although the boat was quite heavy we navigated deep into one of the tunnels formed by the sea. It was incredibly dark and even with the flash of our camera we were not able to shine to the end of the tunnel. Further on we were able to better see the lines running through the marble in different colours. 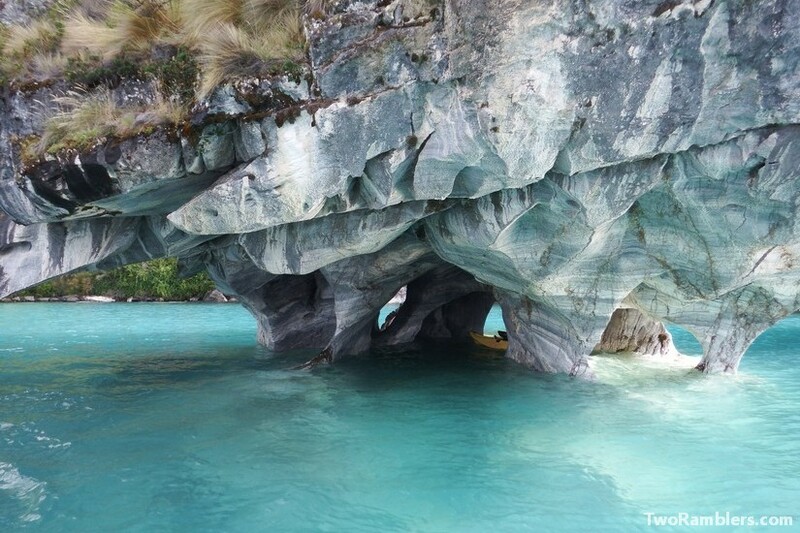 It gave a beautiful picture together with the turquoise water of Lago General Carrera, coloured by particles out of glacier ice. The cliffs hanging over the lake had strange shapes. Our guides showed us a turtle, a dog and an elephant. Then we went on to the cathedral and the chapel. It was impressive how they were standing in the lake, having been there for many hundred years, their base very slowly eroding away from the water, forming new caves and tunnels. On the way back the wind was taking up. We understood why guidebooks and websites recommend to do the tour in the morning. The waves got wild and with loud bangs the boat crashed into them. We held on tightly to the boat and each other as the water splashed into our faces. 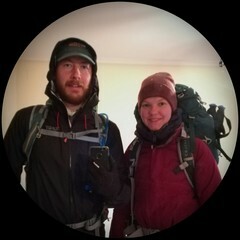 Once we reached the shore we were shaking from the cold. Luckily we found a café serving hot chocolates to warm us up. 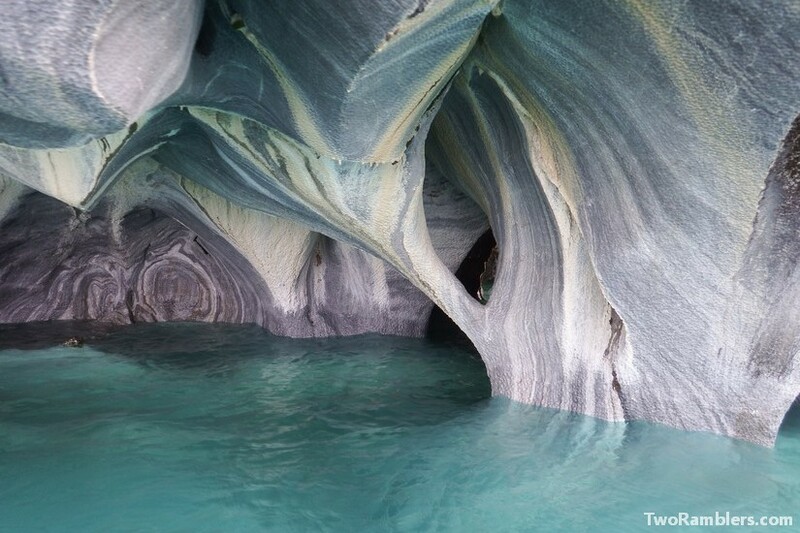 The Cuevas de Marmol with their unique shapes and colours were definitely worth our detour. We would not have wanted to miss out on them.